In 2010 we commenced a major upgrade of our buildings to address concerns regarding the condition of the property and to prepare the suite of buildings to enable our Lord to be served by this and future generations. Heating system problems plus inefficient boilers. Lack of good access for all to the upper floor halls. Upgrade of emergency lighting, fire and smoke alarm systems required. Upgrade of electrical wiring circuits in the sanctuary. Need for an induction loop system in main sanctuary. Adequacy of toilet facilities which had not been upgraded for many years. Organising repairs and overhaul of external roof area. Condition of windows in sanctuary which had deteriorated over the years. 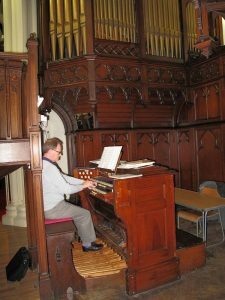 Problems with the pipe organ which had ceased to function. Need for insulation materials to be installed if possible. Work required to modernise the caretaker’s flat. Some adaptation and upgrade work needed at the manse. 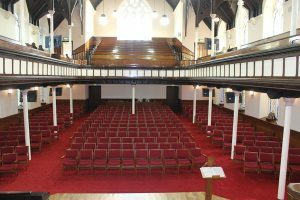 At the outset it was essential to ensure congregational support for what was inevitably going to be a costly and lengthy upgrade. Following a full consultation which showed overwhelming support for the proposals, and support from our prayer groups, it was agreed to embark on our Makeover Project – Forward for Jesus. An incremental approach to the range of tasks that lay ahead, would be adopted. An overriding aim was to undertake the work without incurring debt. The boilers were replaced with 3 condensate boilers (Andrew Macowan and Associates acting as advisers and arranging the contract). The large hall windows were replaced with double glazed PVC units and upper floor windows secondary glazed. Following advice from Hamilton Presbytery Property Adviser and The General Trustees a conservation architect (LBG Waterston of Bothwell) was appointed, after a competitive process, to guide and assist us in the building works to the property and the following contracts were successfully arranged and completed. 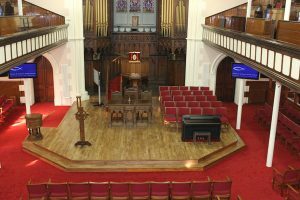 Ground floor pews replaced with individual seating enabling the perimeter radiators to be installed. New heating system with radiators installed. Open chancel created with access ramp. Electrical rewiring of sanctuary secured with additional sockets added and A.V. points added to chancel. New prayer room created in one of the transept areas. New lighting installed in sanctuary. Induction loop fitted on ground floor. Full AV system and tech desk installed – screens on both floors. 3 cameras and sound desk installed plus 14 associated screens added to sanctuary and small hall/entrance corridor. 400 new chairs purchased for ground floor and choir (100 of the chairs with armrests). Front door unisex toilet added. Kitchen, toilets, including accessible toilet, fully upgraded. New baby change room added – new cleaner’s store. Upper floor toilet in halls upgraded. Passenger lift installed giving access for all to upper floor. New lead placed on roof. External walls pointed and partially dressed. 10 ventilation stacks on roof overhauled. Several roof areas re-slated following identification of nail sickness. All guttering and associated paintwork repairs carried out. 6 CCTV cameras added in a new system. During the course of the roof overhaul contract, the contractor identified a major wet and dry rot outbreak around the full wall head area of the sanctuary. In addition, several roof areas were found to be affected by nail sickness and required re-slating. The contract had to be urgently amended to address these areas of work with external stonework dressing excluded at this time. Work was carried out to improve external access at the manse and upgrade of a downstairs WC area carried out. The brick-built gas housing shed had deteriorated to such an extent that it had to be demolished and a new shed cover erected. The weathered condition of the upper floor window areas in the sanctuary was tackled with ventilated poly-carbonate sheeting added as additional protection. The contract to repair the upper floor window encompassed the proposal to do likewise to the large feature window which is located over the front entrance doors. Close inspection, however, revealed that this window was affected by cracking in the stonework which the conservation architect advised required a full replacement of the window, complete with all re-glazing, rather than a repair. To allow an online reach out to the Deaf Community a 4th dedicated camera was added together with a new screen which shows all words spoken and as recorded weekly by an electronic note taker. New chairs bought for the large hall. The aggregate cost of all works exceeded £1.25m with work carried out, over the years, in a series of contacts, each secured by competitive process, and overseen by Mr George Waterston of LBG Waterson, together with assistance from RC Brown, quantity surveyors. With the stated objective of securing the completion of the Makeover Project – Forward for Jesus, free of residual debt, it was so encouraging to secure funding support throughout the project from the congregation with financial donations augmented by funds raised over several years from special events and, for a time, weekly sales of cakes, jams, sweets etc, at a “Makeover Table”. It would not, however, have been possible to undertake work on this scale without grant funding assistance. The congregation fully acknowledge the excellent support provided by the following organisations. It should be noted, that several of these organisations provided support on more than one occasion. The General Trustees of the Church or Scotland. Special Trusts (Church of Scotland). It is so very difficult to name all who ought to be thanked for their support.